National Vice-President for Japan of the Liga Medicorum Homoeopathica Internationalis (LMHI). Specialist in Psychosomatic Medicine and Morita therapy. Ronko graduated from Kansai Medical University with a medical doctor degree and finished her doctorate in Kyoto University with a Ph.D. She got the MFHom as a first Japanese doctor in 2003. She completed the Koiné Three-Year International Postgraduate Course(2004-2007). 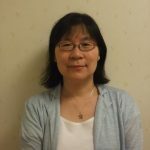 She was a joint research member at the Department of psychology in the Keio University(2005-2011). Fellowship in Integrative Medicine of Arizona Center for Integrative Medicine (AzCIM)( 2012-2014). Ronko translated “Homeopathic practice” and “Homeopathy in Primary care”, and co-translated “International Dictionary of Homeopathy” ,‘‘Homeopathy for Women ‘ and “Be fruitful : The Essential Guide to Maximizing fertility and Giving Birth to a Healthy Child”.